A Water Diet? We have all heard at one time or another how important water is to the health of our body, but, is it the answer to weight loss? The following information about good ol' water is sure to set the story straight. And remember, if you have any questions about water or any other diet topic, be sure to submit your question here at LoveToKnow Diet. The water needs to be cold, optimally at 50 degrees Fahrenheit or colder. Drink the specified amount of water over the course of the day and not at one time. Water must be pure water and not flavored, artificially sweetened, or carbonated. 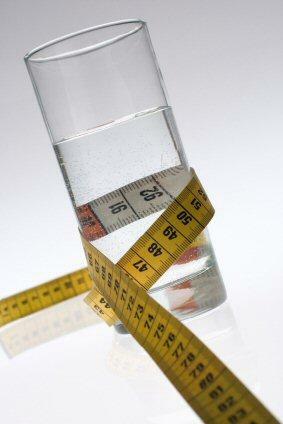 The scientific theory behind the Water Diet is that the body needs to use energy to heat up water to body temperature. An example in the literature explains this with the following equation:The body will burn about 12 calories to raise one pint of 50 degree Fahrenheit water to the normal body temperature of 98.6 degrees. If three pints of water are consumed each day for an entire year, then 4500 calories would be expended just by heating up that total quantity of water, equaling anywhere between one and a half pounds to more than three pounds of weight loss by year's end. Other factors that can help with this potential diet strategy include drinking colder water and/or increasing the amount of water. Also, the theory is extended to claim that by carrying any extra water weight around (one pint of water is said to weigh about one pound), the body is burning more calories than if that extra pound or so of water was not present. This is known as the "carry factor" and is indicative of an additional nutritional science formula that 12 to 18 calories are burned each day per one pound of body weight. Indeed, the potential for slight annual weight loss is apparent, averaging five pounds or so a year without any other dietary changes. But, the need to keep caloric intake in check and appropriate for your particular requirements cannot be overstated. And, one must remember that this simple lifestyle change is not the answer to losing weight that may be causing serious health conditions. For health purposes, drinking water is essential for carrying nutrients throughout the body, removing toxins from the body, preventing dehydration, and regulating body temperature. Most importantly, water is critical for fat metabolism in the liver. Since water carries toxins out of the body, as a person shrinks their fat cells during a weight loss regimen, water accelerates the release of toxins and fluids from those fat cells, so weight loss shows up on the scale quicker than if sufficient water was not offered to the body. An additional mechanism of water and weight loss, besides the claims of the Water Diet, is appetite suppression by filling up the stomach cavity. This often helps with avoiding extra calories from snacking when mealtime may be just around the corner. Fill a 64 ounce pitcher every morning and finish it by day's end. Keep a bottle or glass of water in your car, at your desk, on the kitchen counter, at your bedside and wherever you spend a lot of time and be sure to sip it throughout the day. Include a glass of water at every meal (three glasses are already accounted for). Anyone with congestive heart disease or other similar medical conditions need to consult with their physicians before drinking extra water due to risk of edema and other health risks. Excessive fluid through the kidneys can strain the kidneys, which may not be beneficial for anyone with kidney disease. Also, water soluble vitamins, such as essential B vitamins, can be depleted from the body through excretion. For these reasons, it is recommended that you discuss the proper water intake amount with your physician.